We are so blessed to live in one of Wisconsin's most scenic area. We can be on the famous "Wisconsin Great River Road" within fifteen minutes of our home. I've lived in Wisconsin most of my life, and have seen pretty much every square inch of it, and I tell you, this scenic byway is one of the prettiest areas in the state. The river views are just jaw dropping! The Wisconsin Great River Road is 250 miles long along Wisconsin State Hwy 35. There are 33 historic river towns on the byway. I've already covered a few of them in older posts: Alma, Stockholm, and many others over the years. Today, I want to focus on Nelson, Wisconsin and Wabasha, Minnesota. Because Wabasha is in a different state, it's not considered part of the Wisconsin Great River Road. 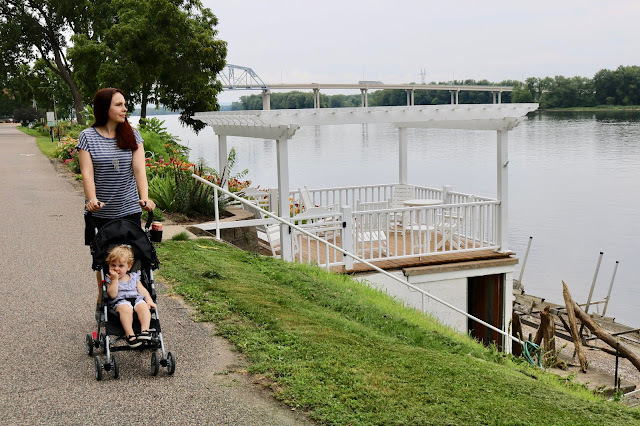 But that's what makes the Great River Road even more interesting, because on the other side of the Mississippi river, is another state, and even more great river towns and parks to explore! On this day, I had my daughter and granddaughter visiting and we were looking for something fun and inexpensive to do; someplace not too far away and where we could take a little walk and just get out of the house for awhile. We decided to go to Nelson since it was the closest little town near our house. Nelson has several nice restaurants: J & J BBQ is my favorite, but we also like Beth's Twin Bluffs Cafe. 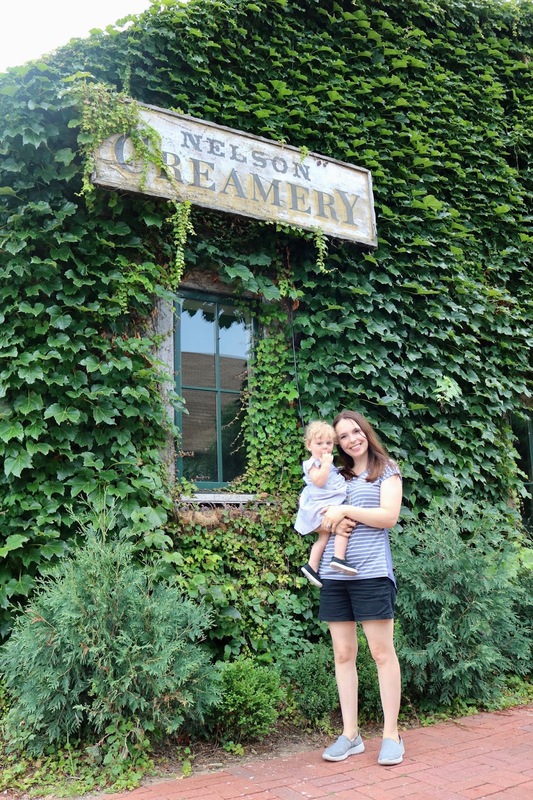 But perhaps every one's FAVORITE place to stop, is the Nelson Cheese Factory. On a hot summer day, you will see a line out the door, wrapped around the building, and winding down the street of people waiting for a scoop of ice cream. Their ice cream is so fresh and delicious, and very inexpensive too. But they also sell every cheese you could imagine, fine wines, gourmet foods, soups, salads, and sandwiches and the best lattes in the area! We had already eaten lunch, and we didn't want any ice cream since we knew we were going to a special ice cream place the next day, so we chose to just have lattes....and they were "Oh, so good!" The building itself is worth a visit. It is the original creamery in Nelson. The stone walls and deep windows are fascinating to me. The outside of the building is covered with this thick, lush, green ivy. After we finished our lattes, we headed to Wabasha, Minnesota, it's only four miles from Nelson. Wabasha has a quaint downtown and is home to the National Eagle Center. You may remember this post from last fall when my husband and I went there to check out their giant pumpkins. On this day we were not here for any specific event and just wanted to stretch our legs, so we took a walk along their gorgeous river walk. 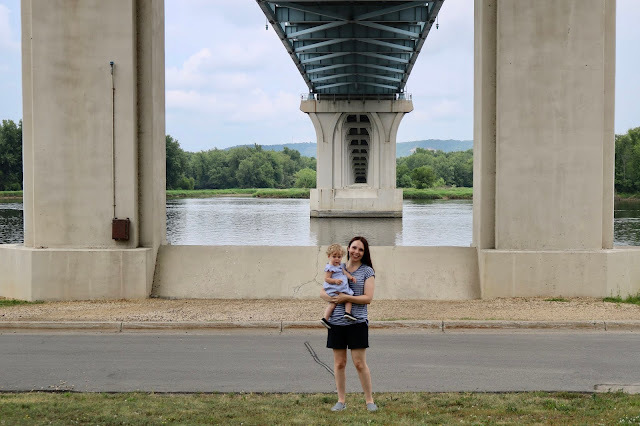 We started under the bridge that connects Wisconsin to Minnesota. This is such a beautiful bridge! It was neat to get the perspective of driving across it, being under it, and seeing it from the ground on the river walk. The river walk is a nicely paved sidewalk with lanterns on one side. At the end of the short river walk, is a fountain, waterfall and statue in front of the National Eagle Center. It is so pretty, especially with the flowers and the scenic landscape in the distance. But we wanted to walk further this day and see more, so we continued on past the river walk and into a residential neighborhood. This was a wealthy area as the homes were amazing. The houses had unobstructed views of the Mississippi river and each house had their own private dock. Some homes built decks like this one where they could sit outside and enjoy the views. But what I was really impressed with was all the beautiful flower gardens. What a backdrop for these beautiful gardens! I loved these short, bushy zinnias. I will have to remember to plant this variety in my own garden next year. I grew the tall ones this year, and they were way too tall. I didn't like them at all. Every time a strong wind came through, it would bend them over or break off flower branches. Here are some of the gorgeous homes in this neighborhood. Can you imagine living here? I fell in love with this trellis, just look at those red flowers! Wow! This was my favorite house too. It's hard to tell in the photos, but it was HUGE! I couldn't even capture the entire house in one photograph. I think this red flower is a Madella Vine. I purchased a pink one this year, but next year I will look for a red mine. Mine never grew this lush, but I also had mine planted in part sun. What do you think of this one? I love the window boxes and the pergola. I can't even imagine how many annuals are planted in all these window boxes, or even the cost. But then, if they can afford a house like this, they can probably afford the annuals too. I love the red, white, and blue color theme. It looks so great with the grey and white house. I love to look at beautiful homes, big or small, old or new, do you? Even though I drool over houses like these, I would never want to live in one. I'd choose a quaint, small cottage over this any day. Next week, I'll wrap up my "Having Fun Locally" series with my final post from this summer staycation. You really are lucky to live so close to such a beautiful area! The river walk looks amazing and stunning homes! 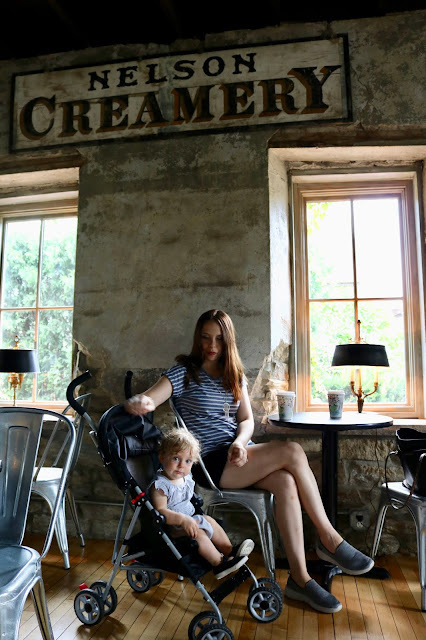 And the creamery looks like a place my whole family would enjoy too! Thanks Ellie! Yes, I'm so lucky to live here. But you know how it goes, when you live in an area, you often don't visit attractions in your own backyard. This summer we changed that, and hopefully we will continue to explore around our home more. Yes, I'd choose quaint as well. The gardens are lovely. I didn't know zinnias come in both tall and shorter varieties, I will have to look for them next year as they flower prolifically. ha ha! I'm so old now that when I look at a large home or yard, all I can think of is all the work. However, I'm sure people who own those homes probably have maids and landscapers. Yes, I love the shorter zinnias. I like how they are more bushy, and I think the flower is prettier than my taller variety. You had me at CHEESE! Haha. Too fun! Oh Ashley, if you could only see all the cheese the Nelson Cheese Factory has you'd die! I drool just walking in the door! What a beautiful area! Enjoy your day! 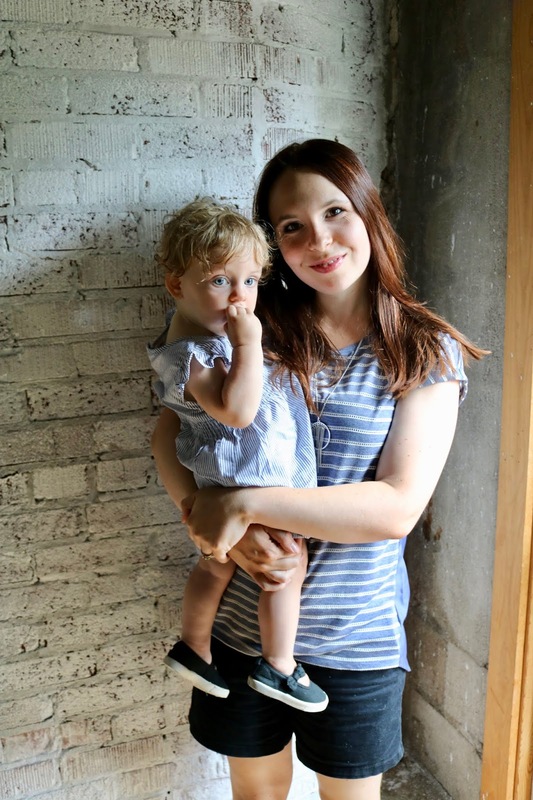 What beautiful homes - and how lovely of your daughter to let you photograph her and that delightful grandbaby. It's nice when they're happy to be part of your blog (and a large part of your life still!) Thanks for sharing on #MLSTL and I've shared on my SM. Thanks Leanne. I am very blessed, I have great kids who love to spend time with my husband and I. God is good! Enjoyed reading about your fun day trip and I loved seeing those pretty houses. Your daughter looks so much like you! Nelson creamery sounds lovely, and I'm with you, that house is beautiful! That's what everyone says, but we can't see it ourselves. Those homes are beautiful as are the flowers. I have never been to a cheese factory didn't really know there were such things but then again it is Wisconsin and they are known for cheese. Yup, Wisconsin is definitely known for it's cheese! Cows and dairy farms everywhere! Haha, when I first read your title I thought the Cheesecake Factory chain! Duh! Oh yum, Wisconsin has the most amazing cheese! When I used to work for a corporation, we worked with a branch of the company in Milwaukee and when I'd travel there, I'd always enjoy some cheese! Beautiful homes! That's so funny, because I kept calling it the Cheesecake Factory when I was with my daughter and she laughed at me. This is so much fun dear! Lovely place, rustic and so inviting. Thanks Jess! It is very lovely. What a wonderful place, Amy, and your photos are always beautiful.